More detailed information can be found on the MJFAF product information page. Key factors to consider when choosing a third party library include code reproducibility, reliability and stability. MJFVCL builds upon the solid foundation provided by MJFAF thereby giving you the confidence to use it in each and every development project. More detailed information can be found on the MJFVCL product information page. IKG is a freeware application used to generate unlock codes for users of the Inno Setup utility. More detailed information can be found on the IKG product information page. The MJFAF and MJFVCL products provide wrappers around various features found in the Indy Sockets open source project to simplify tasks such as transmitting data using the TCP and UDP protocols, with additional wrappers being added on a as-required basis. Even if you're not a user of MJFAF or MJFVCL you can download pre-built binaries (and source) of Indy 9 and Indy 10 from this site. 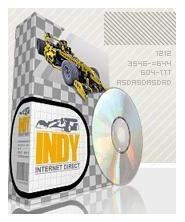 Refer to the Indy download page for more detailed information.